In Arizona, shoplifting can be charged for various conduct involving theft. The basic allegation is that a person was stealing merchandise within a store. Shoplifting can be charged as either a misdemeanor or felony. The crime classification depends on merchandise value, type of shoplifting, and a person’s criminal history. Arizona’s shoplifting statute, ARS 13-1805, defines the following conduct as shoplifting: (1) removing merchandise without paying; (2) purchasing merchandise using either a fictitious account or someone else’s account without permission; (3) paying less than the purchase price using a trick; (4) moving merchandise from one box to another; or, (5) concealing merchandise. To make it easier for prosecutors to prove, Arizona’s legislature created a presumption that when a defendant conceals unpurchased merchandise, or uses a container, instrument, device, or article to shoplift, that the defendant intended to shoplift. Nevertheless, that presumption is rebuttable—meaning a defense attorney can present evidence to a jury to show that there was no such intent. By Arizona case law, Defendants are always entitled to a jury trial in shoplifting cases. A time-consuming jury trial can sometimes be used as leverage in negotiation. Prosecutors have a limited amount of time; as such, they try to avoid jury trials. When the value of the shoplifted items is less than $1,000.00, it will be charged as a Class 1 Misdemeanor. Misdemeanor cases are heard in a city, municipal, or justice court. These courts only handle misdemeanor offenses. maximum misdemeanor shoplifting penalties are 180 days in jail, $4,575 in fines and surcharges, and 3 years of probation. It’s tough to predict exactly what the State will seek in penalties; the prosecutors typically consider the value of merchandise, the circumstances of the case, and the defendant’s criminal history. For first time offenders, jail is uncommon. Misdemeanor Deferred Judgment or Diversion: Certain misdemeanor courts have diversion or deferred judgment programs that afford an opportunity to avoid a criminal conviction. Diversion allows charges to be dismissed upon successful completion of a program; it typically entails probation, classes, community service, and fines. Our office frequently negotiates diversion for our clients by outlining their personal circumstances to the prosecutor’s office. Immigration Consequences in Shoplifting Cases: Shoplifting is considered a crime of moral turpitude, and as such, even a misdemeanor can potentially have a negative impact on one’s immigration and citizenship. Even a deferred judgment plea under ARS 9-500.22 can have detrimental effects because it requires a factual admission of guilt. Shoplifting can be charged as a felony under certain circumstances. A felony dramatically exposes a defendant to more severe penalties and consequences. Below we address each type of felony shoplifting, as well as the potential corresponding penalties. Shoplifting using an artifice, instrument, container, device or article. Career Criminal Shoplifting: Shoplifting when you’ve been convicted within the past five years of two other offenses involving shoplifting, theft, burglary, or robbery. Shoplifting merchandise that’s worth $2,000 or more. Shoplifting that involves a street gang or criminal syndicate. Shoplifting three times within ninety days where the total value of merchandise is $1,500 or more. Shoplifting merchandise worth more than $1,000. Potential penalties for felony shoplifting depend on one’s criminal history and the corresponding felony classification. Class 4 Felony Shoplifting Penalties: Anywhere from probation to 3.75 years in prison. If you have a prior felony record, you can face up to 15 years in prison. Class 5 Felony Shoplifting Penalties: Anywhere from probation to 2.5 years in prison. If you have a prior felony record, you can face up to 7.5 years in prison. Class 6 Felony Shoplifting Penalties: Anywhere from probation to 2 years in prison. If you have a prior felony record, you can face up to 5.75 years in prison. Store owners, and their employees, with reasonable cause, may detain suspected shoplifters in a reasonable manner, and for a reasonable time, in order to question them and summon the police. Constitutional issues don’t typically apply to the actions of store employees; however, if they’re acting under the direction of law enforcement, constitutional protections do apply. Many stores have trespass forms that advise suspected shoplifters that they’re trespassed from the property. Suspected shoplifters should take these serious. If you return to a store after being asked to not come back, the police may be summoned and you’ll likely be arrested for criminal trespass. Regardless of an investigation’s outcome, it’s advisable to never return to that store. CIVIL LIABILITY TO STORES UNDER ARS § 12-691 AND ARS § 12-692. In addition to criminal penalties, shoplifters face potential civil law suits filed by the store. Shoplifting suspects often receive template mail from national law firms threating to file a law suit under Arizona’s shoplifting law. In most cases, the store’s attorneys rarely go forward in filing a law suit—they’re usually empty threats. Before responding to these letters, it’s best to consult with an experienced criminal defense attorney; responding to these letters may have negative legal implications—both civilly and criminally. In addition, in cases where merchandise was not fully recovered by the store, convicted shoplifters are responsible in paying back the store as part of their criminal sentence. The Law on Civil liability for Shoplifting. A shoplifter is civilly liable to the store for a penalty in the amount of the retail value of obtained goods, plus an additional penalty of $250, plus the actual damages to the store. The parents or legal guardians of a shoplifting minor are civilly liable to the store for a penalty in the amount of the retail value of the obtained goods, plus an additional penalty of $100, plus the actual damages to the store. Lack of Criminal Intent: Arizona shoplifting law requires that you intend to permanently deprive the owner of merchandise. Without proving that intent, you cannot be convicted. For instance, if you forget to pay for items, but purchased other items, the State would have to prove that you specifically intended to steal the items you forgot about. In other instances, you might forget about an item in your purse or pocket. In some cases, you might simply forget to pay for something. Lack of Knowledge or Mistake of Fact: You might not pay the full price of merchandise where another person adjusted or switched a price tag, or switched the contents of packaging. A Defendant should not be held criminal liable for such a mistake. Lack of Motive: Financial ability to pay for items, good character, and previous or contemporaneous purchases can all show the absurdity of a shoplifting allegation. In raising this defense, we can present evidence that a client has no prior history of shoplifting or clearly had the ability to pay. This shows that the suspected activity was an accident and nothing more. Unknowingly Passing a Point of Purchase. Suspected shoplifters will often be stopped by store employees simply for passing a register. With stores increasingly moving to automated check outs and streamlined payment options, these types of mistakes are reasonable and increasingly common. Value Defense: The prosecutor must prove the value of merchandise beyond a reasonable doubt. This defense is especially applicable to felony allegations where there’s a threshold value of either $1,000 or $2,000. In can also be applicable in negotiations when a prosecuting agency sets a cut off value in plea agreements. Lastly, it may be a defense where the merchandise in question has no apparent value at all. Constitutional Violations: Miranda, coerced confessions, unlawful detainment or seizure, lack of probable cause or reasonable suspicion, are common constitutional issues that arise in shoplifting cases. If there’s any constitutional violation at the behest of law enforcement, motions may be filed in an effort to suppress evidence and dismiss charges. 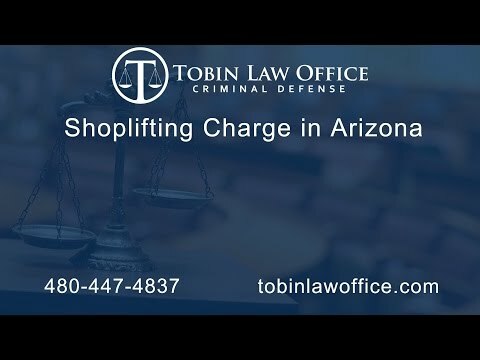 Call or Text Tobin Law Office at 480-447-4837 for a Free Consultation about Shoplifting. Tobin Law Office provides free, friendly, and confidential consultations. There’s never a sales pitch. We’re glad to give you as much information as we can to help you understand your shoplifting case. If we can help you, we’d be glad to do so.